Pretreatment / Cleaning | Westside Finishing Company, Inc.
Pretreatment is the process of removing both organic and inorganic soils to prepare parts for finishing. At Westside Finishing, parts are pretreated using an iron phosphate solution that we apply in a manner specific to the size of the part. The iron phosphate solution not only cleans and etches the part, it also provides a better surface for coating adhesion and adds enhanced corrosion protection. 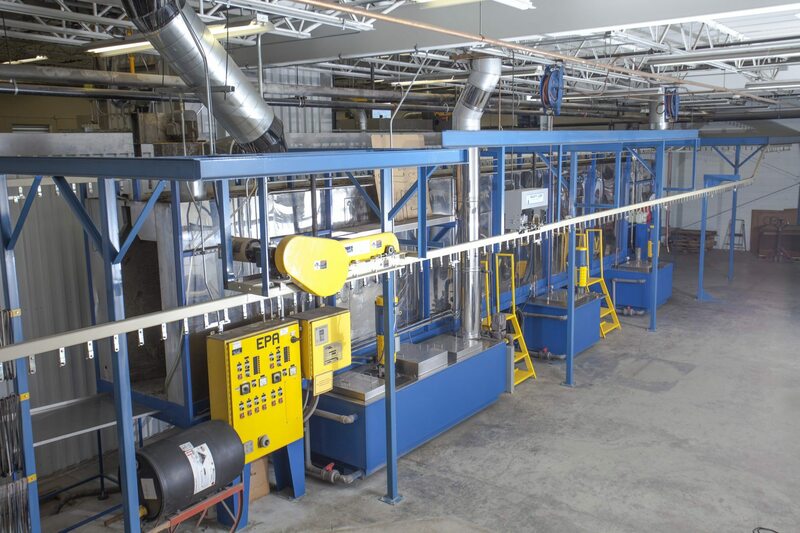 The three methods of pretreatment in our Western Mass facility include our three stage conveyorized washer, our batch cabinet washer, and a manual wand system. This system has the capability to do a 3′ wide x 5′ tall x 12′ long part. The first stage consists of treating the part with the iron phosphate solution at a temp of 140 degrees Fahrenheit. The second stage is a plain water rinse. The third stage is another rinse which incorporates a sealing agent. The sealing agent aids the iron phosphate in its adhesion properties and corrosion resistance. After coming out of the third stage, the part travels directly into a dedicated dry-off oven, and is fully dried before emerging at the end of the process. The cabinet washer, unlike the conveyor, is loaded manually using a hoist or forklift. This machine has the capability to wash parts up to 92″ tall that will fit on a 96″ diameter turntable. The first stage utilizes an iron phosphate solution at a temp of 140 degrees Fahrenheit. The part is then moved into one of our batch ovens to fully dry. We can wash parts of virtually any size by utilizing our power washing area and zero discharge system. Through this system we apply an iron phosphate solution at 140 degrees Fahrenheit. After the iron phosphate we run plain water through the machine to rinse the part. Please contact us to learn more about the pretreatment and cleaning of any part, big or small! Copyright © 2019 Westside Finishing · 15 Samosett Street · Holyoke · MA | Website by Bloo Solutions, Inc.